If you have been reading my blog for a while, you might remember that I was working with Kara & Tom on their living room. Actually, we're working our way through the house but they had a few things to do before we moved forward. Now they are moving at a great pace and I thought I would share a few pictures of where we're headed. After visiting their new home in person we threw out the first inspiration board for Kara, and went a different direction. I hope you enjoy this sneak peak! Doesn't this fixture look great? I can't wait to see it from the outside. You get a glimpse of the old fixture here, which is perfect for someone, just not for them. Here is the before of their living room. Kara found a new upholstered chair and moved the leather club chair to their family room. This chair will make more sense in the room once everything else is installed! See our fabrics in the background? We also turned the couch to face the fireplace. Notice the blue tape? 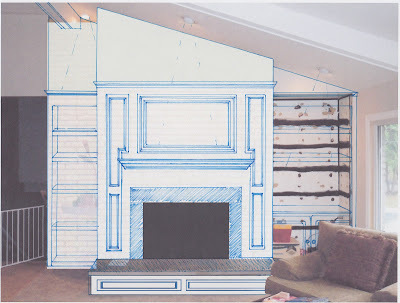 There are a few plans for this fireplace. And say goodbye to those pillows--they are in their last days. they're going to paint the yellow brick white. These built-in cabinets are going to be fantastic! You can see the color white we agreed on near the bottom left. The brick will be a flat finish but I hope I have convinced them to go glossy on the mantle and shelves. 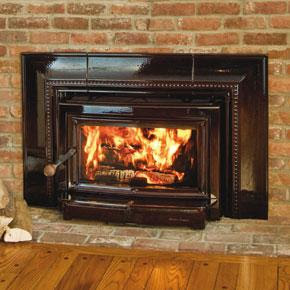 As a finishing touch they are installing this beautiful wood stove. The room will have such a different look when it's done and I can't wait! I love to see a project come together. The best part is that in a few weeks I get to start on a nursery for Kara and Tom. After baby week I am ready to dive in! If you would like to be delighted by your home, contact me at adelightfuldesign@gmail.com. I hope you take a moment to "follow" my blog in the sidebar or subscribe here. Brilliant, Abby! I can't wait to see what you do based on that gorgeous chair. The fireplace will be to die for. Keep it coming :) !!! Hi this room is going to look so much better. Very impressive. It's going to look amazing...can't wait to see the final reveal!! Abby, wow - you can really see it coming together! Looks fantastic. I think the fireplace and the addition of the molding & bookshelves is really going to transform the space. Love the fabric you chose for the chair too!! My favorite colors! What is the name of it? Actually, kara found the chair at Home Goods and texted me the picture! That's long distance design for you! I'm sorry that I don't know the name of the fabric bit maybe kara knows the brand of the chair. Kara? I'm so thankful for the encouraging comments and I'm sure Tom and Kara will appreciate them too! The chair is from Lane Furniture - but I don't know the fabric name. It might be on the tag, I can look later today. I ordered the blue and red fabrics from Calico Corners, and the green fabric from JoAnn Fabrics. It is looking AMAZING! So proud of you!! How fun getting to see the transformation as it happens from the beginning! They are going to be so happy and love spending time in there. Can't wait to see this completed. We have a wall just like that in our home and the angle can be tricky. It looks fabulous!